The Plettenberg Bay Area is one of South Africas premier holiday destinations situated on the Southern Cape coast of South Africa. 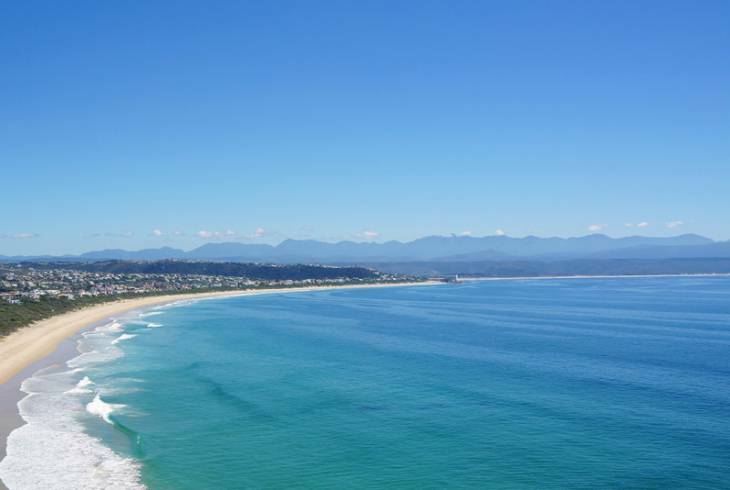 Plett, as it is affectionately known as, has sweeping golden beaches, the iconic Robberg Peninsula, intriguing lagoons and estuaries, towering indigenous forests and unpolluted rivers, vineyards and wine estates. Known as Bahia Formosa, which means beautiful bay, by early Portuguese explorers, the Plett feeling today includes everything from the wine estates and hiking trails in the Harkerville Forest to bungee jumping at Storms River. With its moderate climate and beautiful view sites over the Indian Ocean, Plett is all about lazy sun filled beach holidays and adrenalin filled activities ranging from mountain biking to abseiling and diving with the seals. Visitors will be spoilt for choice with restaurants and shopping experiences, and things to do! Plett is home to wildlife sanctuaries, game reserves, whale and dolphin watching, canoeing up the Bitou and Keurbooms rivers, sailing, boating and so much more. Nestled between the hills covered with indigenous Fynbos and the Bitou River is the tranquil and rural village of Wittedrift, a bird and nature lovers paradise. And from Keurboomstrand to the Robberg Peninsula there are 15 kilometers of beaches puntuated by the river mouth and an island. The river, lagoon, bay and beaches are much used by fishing and boating enthusiasts and offer the best shore based whale watching of the area. 20 kilometers from Plett central is the Crags, an area which has become a must see, with polo fields, wildlife sanctuaries, theater and an abundance of art and craft offerings along its vibrant Cruise the Crags route. And once there, head down the scenic R102 to tranquil Natureâ€™s Valley with its untouched indigenous trees, forest and beautiful pristine coastline for a glimpse of historical beauty. It is also the only town within a national park. A little further down the N2, tucked away in the great forests lying at the feet of the fabled Outeniqua and Tsitsikamma mountains is the quaint hamlet of Storms River. A hamlet which offers teeming birdlife, vast expanses of Cape flora, delicate eco-systems in wetlands and lagoons, gigantic trees and adrenaline pumping activities such as the worlds highest bungee jump and tree canopy tours. George Airport is the major airport in the region serving Plett and is an hours drive away, Port Elizabeth Airport two hours drive away and for private flight arrivals, Plettenberg Bay Airport is only 5 minutes from town centre. All three airports support flights from Johannesburg and Cape Town. Plettenberg Bay Area overview. Plettenberg Bay Area Accommodation and Information.